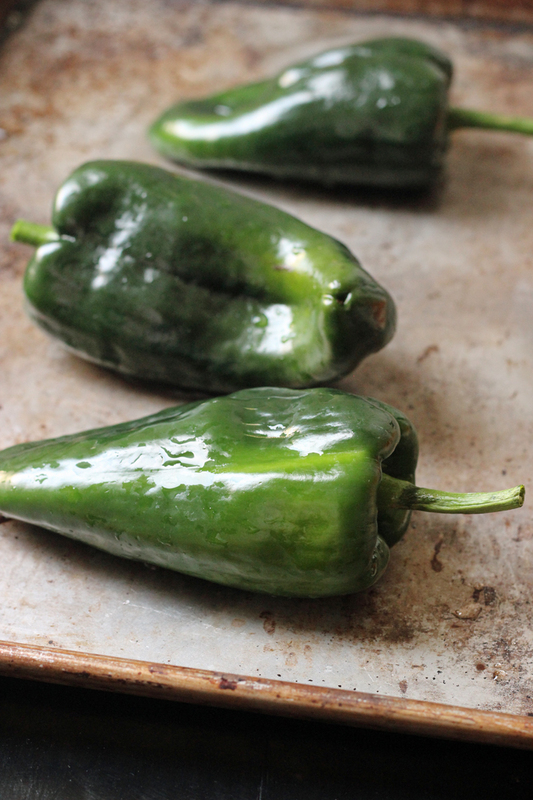 Learn to roast chiles in the oven to add great, spicy flavor to any dish. 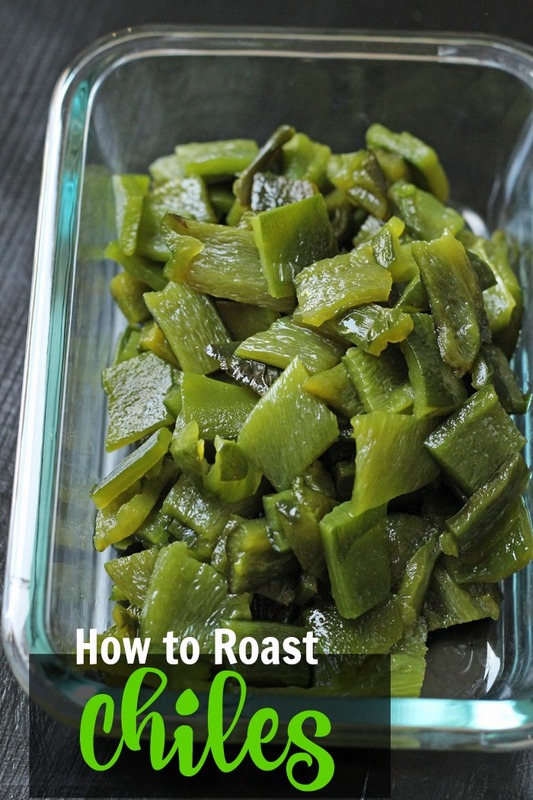 Roast chiles this way are cheaper than the can and taste so much better! 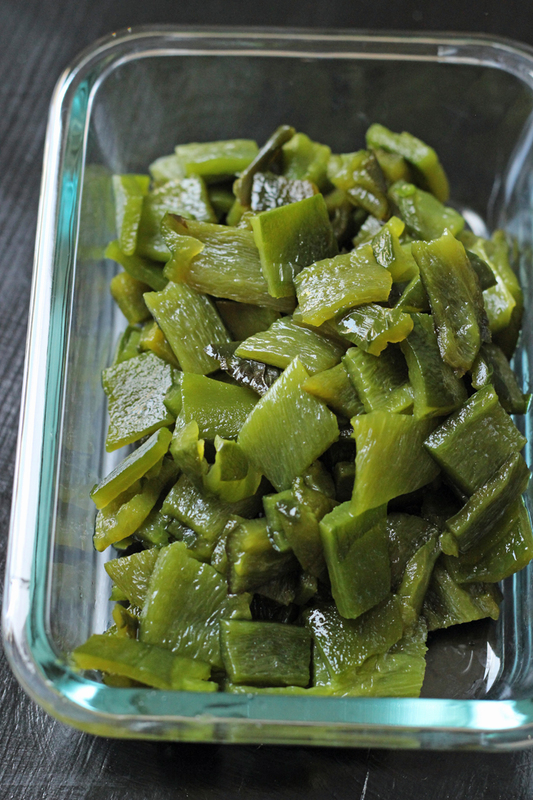 Years ago diced green chiles were a regular in my pantry. Back when they were $0.25 a can. Today they are regularly over three times that early 1990’s cost! Sometimes I find them as high as $1.50 a can in my neighborhood. When we moved to one income I decided that canned chiles weren’t a necessity. Spicy food was mandatory, but not the little green guys in a can. I started replacing them with finely diced jalapenos or roasted poblano chiles, pictured here. Now, there is some culinary dispute over the poblano chile. It’s often marketed as a pasilla. And that is how I first discovered it in my grocery store on Calle Real in Goleta, CA. However, technically, this is a poblano. And, technially, and otherwise, it is delicious. Especially when you roast it. Rinse your peppers and poke a hole in one end. Lay them on a baking sheet and place in the broiler. Broil for about 5 minutes, turn, and broil the other sides. Sometimes, the peppers can be really round, necessitating several turns, but sometimes they’re flat, needing just a flip. The skins will be black and charred. Place them in a covered dish, paper bag, or wrap in foil, whatever is easier, to steam the skins loose. Then peel. Some peppers are really hot, some aren’t spicy at all. It’s a mixed bag. But, be careful, as the juices can burn. You might want to wear gloves or plastic bags on your hands as you peel. Pull away skins, seeds, and the stem end. I don’t mind if they tear because I usually use them chopped or sliced in my recipes. And I don’t worry about some straggling seeds. They help add some spice. You can store the roasted chiles in the refrigerator for up to 4 days in a covered container, or for 2 to 3 months in the freezer. Just be sure to chill them completely before placing them in the freezer. It’s so convenient to pull out home-roasted chiles for recipes! We love to add these scrambled eggs as well as in Poblano Chile Enchiladas or other Mexican-style casseroles. Yum! What kind of chiles do you like and what do you do with them? Originally posted May 20, 2010. Updated April 22, 2017. I’m sure I’m the only one, but I don’t know what is meant by ‘steam the skins loose’? 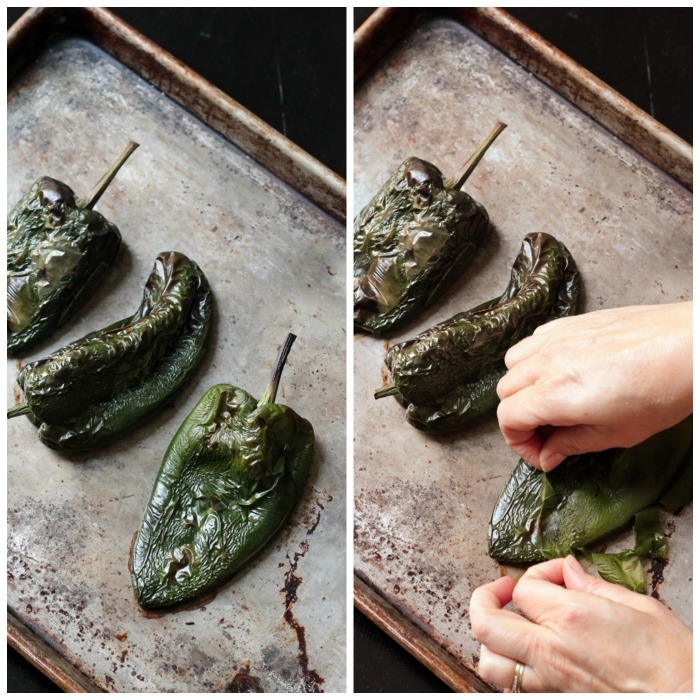 Once the chile is roasted and steamed, the skin or peel loosens so that you can slip it off fairly easily. what is the Purpose of poking a hole in One end of the pepper? Well, I read that in a cookbook a long time ago. I assumed it was to let steam escape. I really don’t use them that often but would still like to try this. Can I freeze them after roasting and removing skins etc? Or should I just roast them as I need them? Yes! I freeze them in small ziptop bags or containers with lids. Makes it so convenient! What’s the best way to thaw them from the freezer? I just set them in the fridge overnight or on the counter for 30 minutes. Depends on how you’ve packaged them for freezing. Great, thanks! I just put them in a little Tupperware. Do you find you have to reheat them at all prior to putting them in enchiladas? Or just throw them in cold and let them cook in the tortilla? I add them cold. They’ll get hot in the enchiladas. So glad you enjoyed them! I love self-reliance like this! Make your own instead of buying from the store!